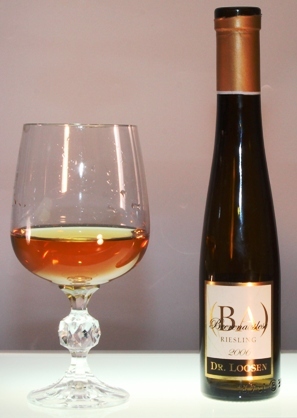 Comparing “Ice Wine” to a Trockenbeerenauslese (just say “TBA”) is like …. well, let’s step back: a TBA is wine made from the Riesling grape. California, Washington, New York here and countries other than the United States make wine from the Riesling grape. But for my money, the standard bearer is/always has been Germany; specifically, the region of the Mosel-Saar-Ruwer. You likely won’t see those three names on the label as labeling was simplified in 2007, but if you see “Mosel,” you’re getting the real thing. The other label hint is to look for is “Qualitatswein Mit Pradikat” (old term) or “Pradikatswein” (or just say “QmP”) on the label. So what’s the big deal about TBA if it is just another squeezing of the Riesling grape? Well, just like the classification system for wine in Bordeaux is based on producers (1st through 5th Growth in Medoc, for example), Germany’s classification system is based on ripeness levels. Don’t get nervous. We’re not talking about that cloyingly sweet pancake syrup-like wine you may have been exposed to as “sweet wine.” Germany is so far north, it’s difficult to fully ripen grapes. So yes, TBAs are sweet, but sweet like a fine French Sauternes… yet better. Before we talk about why, let’s look quickly at the classification levels. First is Kabinett. When you see that on the label of a Riesling, you can look forward to a wine focused on fruit flavor, the fruit being the grape. It is crisp, light in body and refreshing and surprisingly dry – especially if you are used to domestic Riesling. Next comes Spatlese, also light and refreshing, but just a tad sweet. It’s beautifully perfumed and offers pale tastes of citrus, lime and pineapple. Great with spicy Thai food because its acidity cleanses and cools the palette and finishes clean. That last part is worth repeating: it finishes clean, so it’s not cloying. Up the ripeness/sugar scale comes Auslese. It has a richer, fuller body, a longer finish. The taste is richer, more complex. You might pick up a taste of almond and apricot. Then we get Beerenauslese (BA) and TBA, with TBA the sweetest and made only in exceptional years. At the BA level, you will be blessed with grapes that are handpicked and very carefully selected after being shriveled by a fungus (Botrytis cinerea). This is epitomized in TBA, the grapes shriveled like raisins, so many needed to produce just your one bottle of wine: a wine with a silky mouth feel. Think Sauternes, but better. Think tastes of stone fruit like white peach and apricot, almonds, marzipan, honey, vanilla. Full bodied, long finished…. The experience of a TBA will live in your memory forever. Working in Chicago some decades ago, in an office near a German neighborhood, I had the pleasure of meeting with a neighbor whose brother maintained a vineyard in Germany. I often sampled and bought the family’s wines. Then too, German Riesling wines at all levels were commonly available in liquor stores. Today, it will require an exhaustive search and a sizeable investment to procure a TBA. Instead, you will be offered Eiswein, or Ice Wines. These are often domestically made, or from Austria or Canada, from grapes other than Riesling and not produced under the same circumstances. If you enjoy such wine, cheers! But when you’re doing so, or buying them, or talking about it … please, do not compare it to a TBA. And that brings us back to my opening statement: Comparing Ice Wine to a TBA is like comparing a Puddin’ Pop to Tiramisu. You may like either one, but you can’t compare them favorably. Thank you for your comment. I am publishing it below, but without the link being copied. The wording looks safe but, unfortunately, in the world of our web, I can't publish links and potentially expose my readers to malware. Otherwise, your comment appears unedited and I do thank you for it. So my mother has a bottle of 1979 Felser Schillingsberg TBA Eiswein that she has had for forever (around 30-35 years). I am trying to find some information on it, as she knows next to nothing... thanks to your site, I know that it's made with the Reisling grape, a personal favorite. I may get her to crack it open if I finish college. The only site I've found with any information about her particular wine says next to nothing other than its good. I was hoping you may know something about it. TBAs and Eiswein are different and Eiswein is not always made from Riesling. Because of the wine's acidity and residual sugar, either will cellar well but that assumes good conditions: even and cool temps, racked so as not to be jostled and kept out of light. Check the color of the wine in the bottle. If it's brownish, it's past its potential to offer any enjoyment.